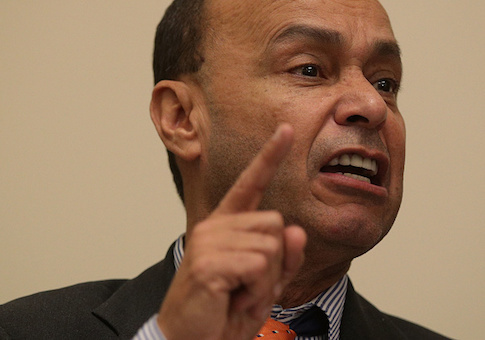 Democratic Rep. Luis Gutiérrez (Ill.) suggested Tuesday that retired Marine general and White House Chief of Staff John Kelly has tainted his military service by working within President Donald Trump’s administration. This statement was made amongst Trump ending Deferred Action for Childhood Arrivals (DACA), a program aimed at protecting young immigrants from deportation whose parents came over with them illegally, The Hill reported. "General Kelly is a hypocrite who is a disgrace to the uniform he used to wear," Gutiérrez said in a statement shortly after Attorney General Jeff Sessions announced the immigration policy would be phased out on Tuesday. "He has no honor and should be drummed out of the White House along with the white supremacists and those enabling the President’s actions by ‘just following orders.’"
Gutiérrez, a member of the Congressional Hispanic Caucus, claimed that Kelly went back on his commitment to protect DACA while serving as Homeland Security Secretary. "General Kelly, when he was the head of Homeland Security, lied straight to the faces of the Congressional Hispanic Caucus about preventing the mass deportation of DREAMer. Now as Chief of Staff, this former general is executing the plan to take away their lifeline and taking steps to criminalize young people who live and work here legally," Guriérrez said. Kelly, in addition to being a retired four-star general, is also a Gold Star father; his son was killed fighting in Afghanistan. DACA is an executive order put into action by former President Barack Obama that protects almost 800,000 people who were brought into the country illegally as minors and now seek work permits. Gutiérrez said this reversal is a step in the "wrong direction" and he will withhold his support from any further legislation that does not include protection for DACA recipients. "I personally will not support any funding bill that does not include a safe harbor for DREAMers—and I will work to have others join me in opposition," Gutiérrez continued in his statement. "If they need our votes, we are bringing 800,000 young immigrants with us." Although lawmakers on both sides of the aisle have requested an amendment of the program rather than rescinding it altogether, Trump made it clear on Twitter that the issue will need to be resolved in Congress. This entry was posted in Politics and tagged Congress, Donald Trump, Illegal Immigration, Immigration Reform, Jeff Sessions, John Kelly. Bookmark the permalink.